Sod's law isn't it? Everything has to run out at the same time, then instead of replacing items you then go through all your travel sizes. However on the positive for once I've actually used up products without casting products to one side when new items have been bought. 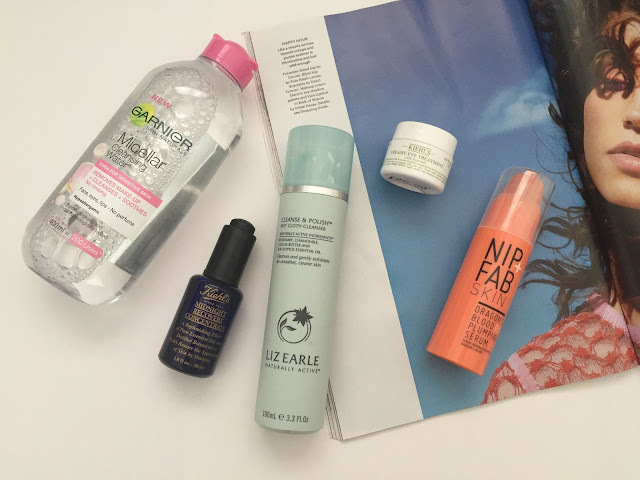 If you've been a regular reader of the blog, you will know how much I like to rave about Liz Earle Cleanse and Polish, even going as far as saying it's my holy grail cleanser. However since repurchasing this - I'm actually not that fussed on it anymore. It does an amazing job of removing every little bit of make up off my face, but I'm actually wishing I'd repurchased No7 Hot Cloth Cleanser instead or a Clarins one. Luckily I've got two No7 vouchers so I'll be stocking up. I've managed to get through my stash of Bioderma with the exception of one small bottle which will be kept for those occasions when my face is well and truly caked with make up. However for everyday make up (and a carpet cleaner - don't ask but it works a treat) I'll be reaching for my Garnier Micellar Water. Hands down this has to be the best drugstore micellar water which is out there, and unlike other waters one sweep of this gets rid of any stubborn eye makeup and mascara. It doesn't dry my skin out or sting my eyes - win win. For my eye cream, it has to be Kiehls Creamy Eye Treatment with Avocado (review), no other eye cream has worked as well for me. If you are looking for an intensive hydrating cream, look no further than this. It's a shame Kiehls don't do this as a facial moisturiser (hint hint). Nip + Fab Dragon's Blood Fix Plumping Serum is my morning serum and my skin has been screaming out for this to be added back into my skincare routine. By far this has to be one of the best serums and one which I have seen a visible difference in my skin with. I find that after using this my skin looks hydrated and healthier which after a long day at work is a massive win win. Also you can normally get this on offer for less than half price in Superdrug or Boots. Finally one product which I have literally been desperate to get my hands on for literally months and months, however swore that I would not buy it until I used up all of my Estee Lauder Advanced Night Repair serum. That day has finally came and I could try Kiehls Midnight Recovery Concentrate. At first I hated the scent and texture of this, as it's more of a dry oil, however after using this for a few days, I could instantly see a difference in my skin texture and appearance. For some reason I do miss the Estee Lauder serum, however I'm really enjoying using this. I have decided though I want to try their Powerful Line Reducing Concentrate next as you do. What skincare items are you loving at the moment?